MR. HARRIS CHERAMIE OF LEEVILLE PRESENTED WITH FLAGS! 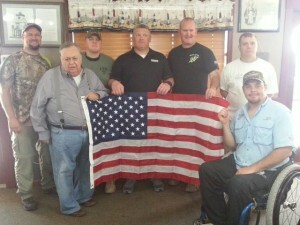 May 3, 2014-Mr. Harris Cheramie, owner of the Leeville Seafood Restaurant and a Wounded Warrior Hero himself, was presented with a US Flag that was flown over the US Capitol and a State Flag that was flown over the Louisiana State Capitol as an appreciation for his support of the Wounded War Heros here in Louisiana! GOD BLESS THE USA and ALL THOSE SERVING OUR COUNTRY! L-R: Ryan Hurst USMC, Mr. Harris Cheramie, Matt Hackler USMC, Danny Jackson USArmy, John Nolan USAFSOC, Dustin Mince USArmy, and Trey LaFitte USMC.